Since Kwanzaa is a relatively new holiday, you, your family and your community can use your creativity and imagination in the way the holiday is observed. 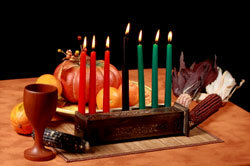 Choose an area in your home where you can set up a Kwanzaa altar or table. Decorate it in the same spirit as other holidays you celebrate. Create posters and banners to hang on the walls, add African sculptures or other artwork. Many crafts and decorations can be created by the children of the home to be used in your Kwanzaa display. When setting up the Kwanzaa table first cover the table with a black or green tablecloth. Then place the Mkeka (mat) in the center of the table. Add the Kinara (candleholder) containing the Mishumaa Saba (seven candles). The colors of the candles are red, green, and black which are the colors of the Bendera (or African Flag). The black candle is placed in the center of the Kinara. The 3 red candles are placed on the left side of the Kinara and the 3 green candles on the right. The Mazao (fruit and vegetables) are placed in a bowl or basket and then added to the table. One ear of Muhindi (corn), for each child in the family, is placed on the Mkeka. If there are no children then one ear of corn is added to symbolize the children in the community. Zawadi (gifts), in the form of books, videos, or other educational resources are added. Heritage symbols such as African sculptures or other artwork can be added to enhance the display. On the wall behind the table hang posters, banners, and pictures, either purchased or created by the children of the family. You can also hang a Bendera, the African flag containing the colors black (the people), red (continuing struggle), and green (the future).